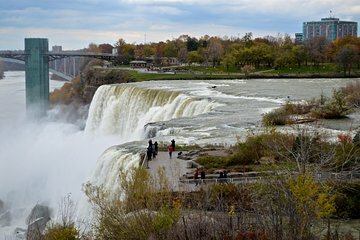 Experience the top spots of Niagara Falls on a guided half-day tour. Depending on the season, stay cool or cozy in a comfortable tour bus as you cruise through this scenic site, stopping regularly for photo ops. Enjoy a multitude of attractions that could include Three Sisters Island, Cave of the Winds Gorge Walk, or the NYS Observation Tower (depending on date booked). Listen to guided commentary and make numerous stops at prominent lookout points. Visit the Cave of the Winds, Luna Island, and more.